Can you do risk based inspection (RBI) and extend inspection frequencies in your country? Most likely yes, but only if you first justify your decision and document it. If you work in Europe, you likely are familiar with the Pressure Equipment Directive 97/23/EC, affectionately called PED. It regulates the design, construction, installation, modification, and conformity assessment of Pressure Equipment and Assemblies.Europe also has the Engineering Equipment and Materials Users Association (EEMUA), a non-profit membership organization helping companies that own or operate industrial facilities. As an initiative from EEMUA, the European Committee of User Inspectorates (ECUI) was started in 1992 and now it is made up of User Inspectorate organizations from across Europe. More recently, the ECUI released a Position Paper: In-service inspection of pressure equipment (Rev 2007). The ECUI realized that when the PED was implemented across Europe, the practices for inspection of new equipment followed PED, but the practices relating to in-service equipment varied considerably. The study that led to the position paper showed that each EU Member had regulatory requirements for in-service pressure equipment in terms of the scope, nature and periodicity of inspections and the authorization of Inspection Bodies. These regulations were written mostly in terms of contained energy in equipment and history, size and complexity of the plant they were in. The degree of flexibility of those regulations varied significantly; some countries imposed prescriptive requirements which afforded little room for initiative, while other countries implemented a more flexible approach which placed primary responsibility on the user for safe equipment management. Looking closer at the level of Government Regulation in Spain, for example, there is the “Boletin Oficial del Estado (Government Bulletin) Nr 31 Section 1, Page 12350, February 2009” with Technical Instruction ITC EP-3 for refineries and petrochemical plants. Article 6, Paragraphs 5 and 6, explains that the user must perform additional periodic inspections if required due to corrosion or damage. It also states that when the inspection history shows no operational upsets and no significant damage, the inspection scope and intervals can be modified with previous notification and authorization of the regulator in accordance with Article 12 of the “Reglamiento de Equipos a Presion” (Pressure Equipment Regulation), Real Decreto 769/1999. DNV-RP-G103 January 2011. Non-Intrusive Inspection. DNV-RP-G101 October 2010. Risk Based Inspection of Offshore Topsides Static Mechanical Equipment. DS/CWA 15740:2008 Risk-Based Inspection and Maintenance Procedures for European Industry (RIMAP). This is a CEN Workshop Agreement document (CWA), applicable to the entire European Union. But before you use those standards and start to build a spreadsheet, keep the following in mind. Managing pressure equipment through RBI, but without an integrated approach, is a daunting, even dangerous task. This is because RBI involves a lot more than just calculating the risk level and scope of the inspection. When an organization decides to implement RBI in a facility, the first thing to do is to develop the RBI methodology and register it in a technically sound and auditable way. The methodology document will define the RBI approach, including specifications and standards, roles and responsibilities, documents and deliverables. 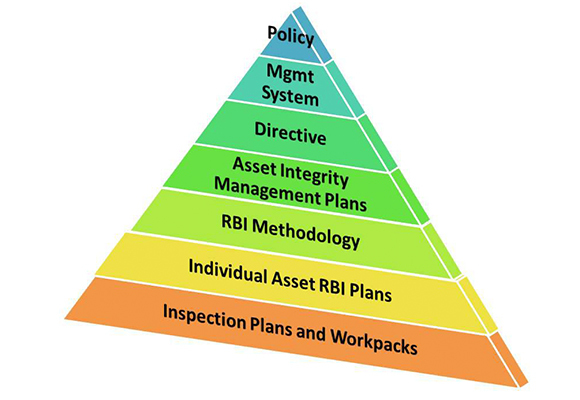 It will define how the RBI integrates with the risk management processes and asset integrity management within your company, as well as how it underpins the asset integrity management plans. It also defines how individual asset RBI plans are created. The methodology is so important that a multiple day workshop is required, involving stakeholders in maintenance, reliability, operations, HSE, and process safety. Can you imagine the level of effort required to put together all that documentation and then manage the information being generated almost constantly? We often think of a CMMS, EAMS, AIMS or APM, generally limiting our thoughts to how they help manage information related to assets. But RBI is much more than that. The RBI software actually becomes part of the processes in your organization; it is part of the documented framework that you will show to auditors, insurers, regulators and customers. What happens when an organization has a variety of software, each one part of the puzzle to ensure compliance and mitigate risk? Can you prove that all information is accurate and current? What if asset failed? Are the inspection results readily available? Is the same methodology being used in the same way by all your engineers at all the sites of your company? Next, you also must consider how to treat other type of assets in your organization that are not covered by the RBI, like rotating equipment and instrumentation. Do you just leave them for other departments or teams to sort out? Who can access information about all the types of assets in your facility, without using multiple spreadsheets, documents, point solutions and SharePoint sites? Using a tool like Predix Asset Performance Management (Predix APM), with the mechanical integrity work processes provides answers for all of these questions. GE Digital's APM currently provides API 580/581 risk calculators and strategies, as well as supports the Brazilian standard NR-13 for Inspection Management. The software calculates risk levels and determines inspection dates. Links to DCS/SCADA also detect if the asset has operated outside the Integrity Operating Window (IOW). But, more importantly, it provides a documented methodology and workflow for mechanical integrity right out-of-the-box. Following a RBI methodology and workflow that connects with the rest of the organization to manage all types of assets, can make the process easier and start saving you money, even before you start managing your assets. With more than 10 years of experience in Asset Performance Management, Vipin is a product manager for our Compliance &amp; Integrity Management solution, delivering high-value product solutions and managing the overall product life cycle for fixed and linear assets.